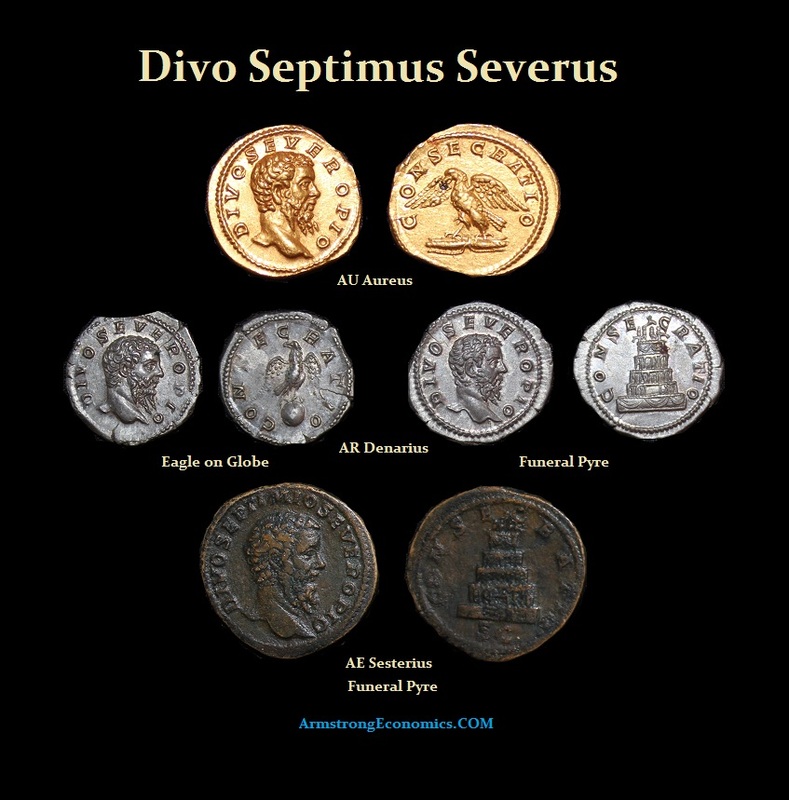 Lucius Septimius Severus was born in 146 AD at Leptis Magna (coast of Libya) in Africa and as such was the first Roman Emperor of North African origin. He was of humble origin. His father was Publius Septimus Geta and two of his father’s cousins did attain the rank of consul. When Severus was 18, he moved to Rome where he was made a senator by the Emperor Marcus Aurelius. Thereafter, Severus proved himself to be an outstanding soldier of considerable ability. He held a series of increasingly important commands until, at the death of Commodus, he was Governor of Upper Pannonia. Little is known about Severus’ first wife Pacca Marciana who was from Lepcis. His second wife was Julia Domna whom he married in 186 or 187 AD. Julia was from the old ruling dynasty of Emesa and her father was high priest to the sun god Elagabal in Syria. 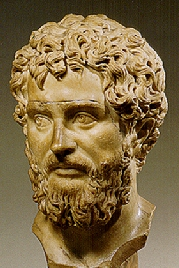 Severus and Julia had two sons, Caracalla and Geta. Julia would prove to be a formidable wife intent upon power and intrigue. She was notorious for her love affairs. 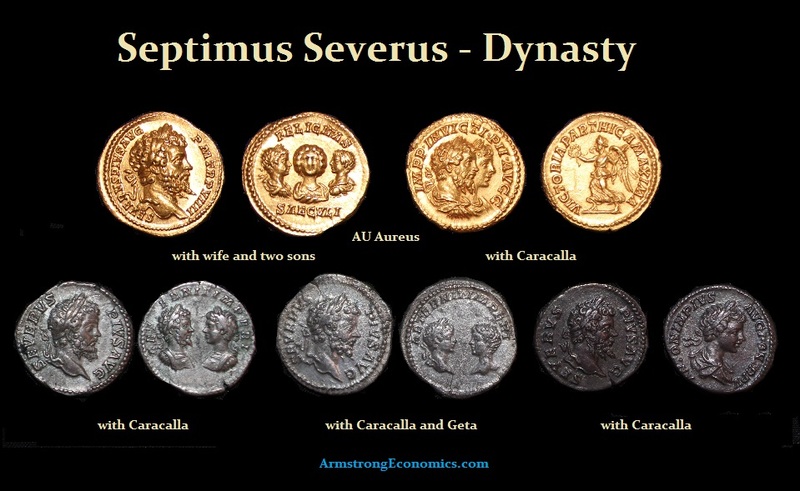 Following the death of Commodus, Severus initially professed his allegiance to Pertinax. However, following the murder of Pertinax and the shameful elevation of Didius Julianus by means of public auction, the mood within the empire was very much dissatisfied. 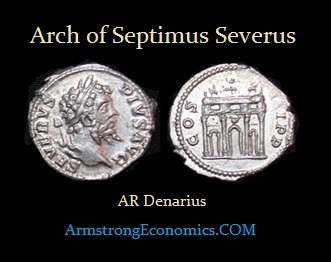 Severus was saluted as Emperor by the troops at Carnuntum and began his march on Rome in April 193 AD. He rapidly disposed of Julianus and Niger and later attacked and defeated his third rival, Clodius Albinus in 197 AD, with whom he had originally agreed to share power in return for his support. One of his first acts as Emperor was to avenge the death of his friend Pertinax. The Praetorian guard were led outside the city gates dressed for a ceremony thereby leaving the weapons behind. 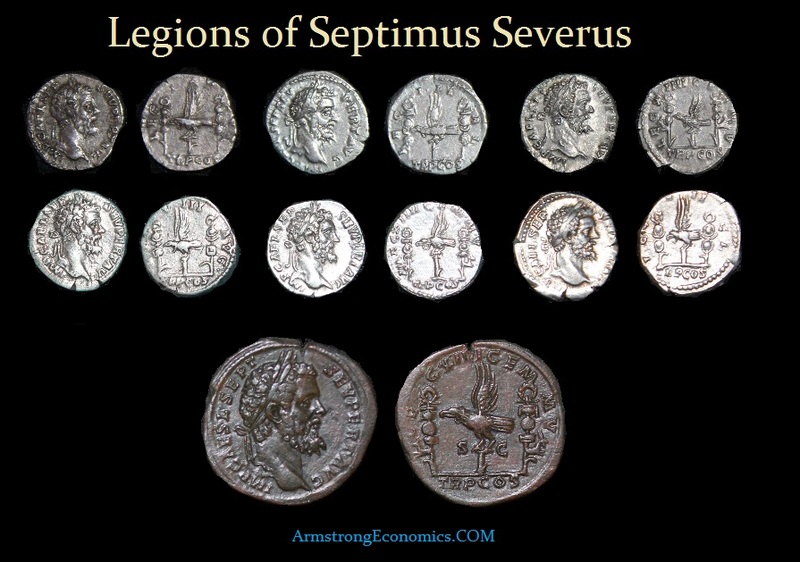 Severus ordered his own troops to surround the Praetorians. All those who took part in the murder of Pertinax were executed. The survivors were dismissed and warned not to come within 100 miles of Rome or face execution. 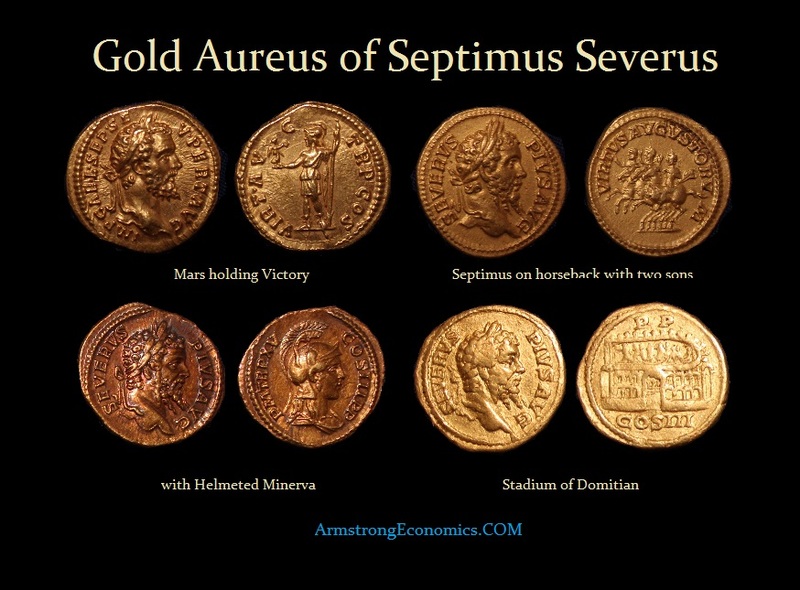 After defeating all his rivals, Severus then rooted out all the supporters within Rome of both Albinus and Niger. In what became known as the Purge of 197 AD, Severus executed 29 Senators. His reputation was one of cruelty and ruthlessness. Severus was never popular with the Senate and as such relied primarily upon the army to maintain his power. 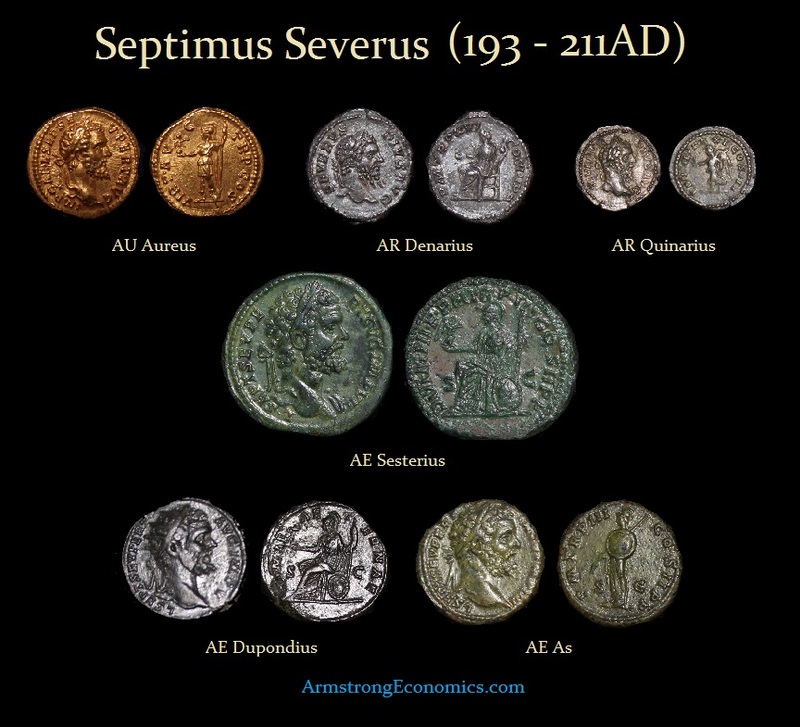 Septimus Severus was determined to establish his own dynasty. He issued quite a prolific series of coins in silver and gold showing himself with various members of his family. Dio tells us that Severus was addicted to astrology. In fact, he married Julia Domna based upon her astrology chart because it predicted that she would marry a great king. Severus spent much of his reign campaigning in different parts of the Empire. Severus attacked Parthia, killed all the men and enslaved 100,000 women and children. He also emptied the treasury in 197 AD. This victory is commemorated by the Arch of Severus still standing in the Forum today. It was erected by the Senate in 203 AD. Later, Severus visited Egypt where he went to view the embalmed body of Alexander the Great. 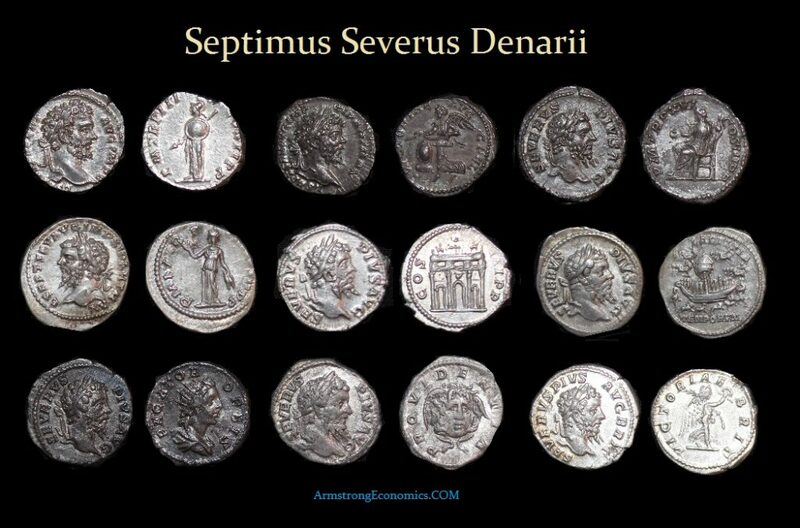 In 202 AD, Severus returned to Rome. He set about planning his dynasty. Caracalla, his eldest son by Julia Domna, had been raised to the rank of Augustus in 198 AD. Severus now set about finding Caracalla a wife. Publia Fulvia Plautilla was the daughter of one of his friends — Gaius Fulvius Plautianus, commander of the Praetorian Guard. Caracalla hated Plautilla and vowed to have her killed once he became Emperor. There are two versions to the story at this juncture. One tells us that Caracalla sought to get rid of his wife and father-in-law by claiming that Plautianus was planning to kill Severus and his family. The other version tells us that Plautianus did indeed try to have Severus and his family murdered. Whatever the case, the outcome was the same. Plautianus was executed and his daughter sent into exile. Upon Severus’s death, Caracalla’s hatred for Plautilla had not subsided. One of his first acts was to have Plautilla murdered. Rivalry had already begun between Caracalla and his brother Geta. In 208 AD, Severus took his two sons and traveled to Britain where there was much unrest following a great invasion by the barbarians of the North in 197 AD. Severus repaired Hadrian’s Wall, which had been partly destroyed, and invaded Caledonia, but without much success. The strains of this campaign, however, proved too much for the old Emperor and he died at York on February 4th, 211 AD. 194 TR.P.II – IMP III, IMP IIII COS.II. P.M. P.P. 197 TR.P.V. – IMP VIIII IMP X.